Are you gearing up for your 100th day of school? Here are some activities I’ve done with my students to make the 100th day of Kindergarten very memorable! Read on to grab the FREE counting mat too. There are some Amazon affiliate links included in this post to help you find materials I’ve used with these activities. Decorated Door: To kick off the 100th day of school, I made a banner and added streamers. Then I taped it up at the entrance of my classroom. It’s a fun way to start the day. Pictures: I used this frame for the 1st day of school, so all I had to do was change the star to say “100th” and it was ready to go! I print a picture of each child holding this frame on the 1st day, 100th day, and last day of Kindergarten. These make for a nice keepsake of how they grew throughout the year. To make the frame: I got a white foam board, cut a big opening out, and then simply decorated the front of it. 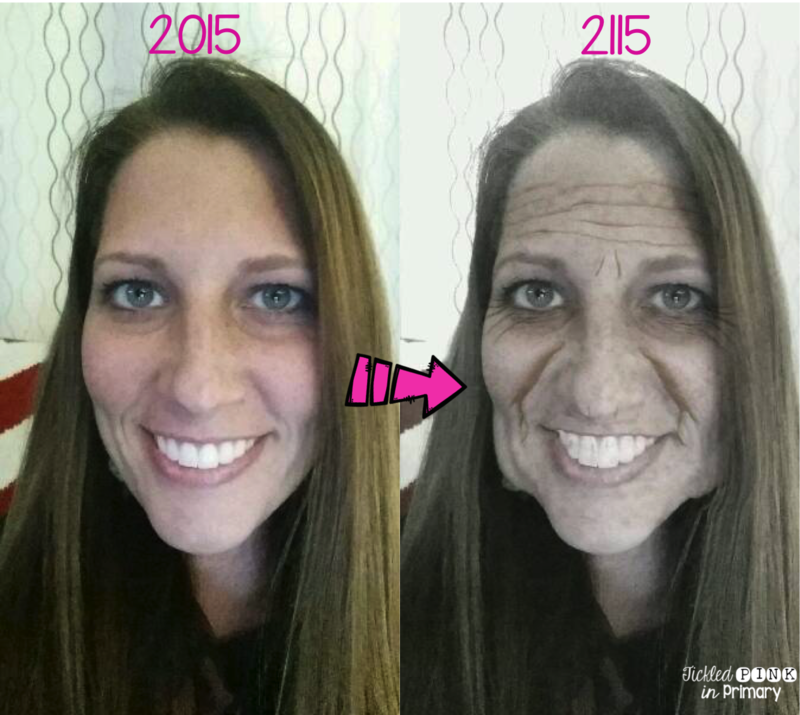 Another photo activity I’ve done was to use and app to see what we’d look like in 100 years. The Aging Booth app is available for both Apple and Android devices. I took the photos on my iPad so I could then use my Apple TV and show them what they’d look like in 100 years. They were cracking up! Here’s one I took of myself so you can see how it works. Pretty gross, huh?!? At one of my past schools, we did an entire grade level photo. We had only 3 Kindergarten classes, so each class formed a number to make a GIANT 100. We then printed out a photo for each child to take home. I thought it would make a special memory for them. Snack: To give the students a little treat, I give them 1 Kit-Kat and 2 Reese cups. They have to build the number 100 before they can eat it. This is a quick and simple activity, but it’s nice to have a moment to just chill and have a little snack. Number Hunt: One year our entire grade level did a 100th day duck hunt! We bought 100 plastic ducks and made cards 1-100 to sit next to each duck. At this school, there were 6 K teachers, so we divided the ducks and hid them around our classroom during the student’s lunch time. When they came back from lunch, we divided the kids into 6 groups. Students went around to hunt through each room for the ducks. As they found a duck, they colored that number on their 100 chart. The students LOVED this and yes, it was a bit chaotic in our rooms and in the Kindergarten hallway, but it was worth it. Sorting Activities: For many years, I’ve had students bring in a collection of 100 items. We then take time to count the items to give us more practice counting to 100. I know many of you probably do the fruit loop necklaces already. We used these counting mats to help us keep track of our fruit loops. Students could make sure they had 100 and practice counting by 10s. Grab this FREE counting mat to use for your 100th day of school. Fluency & Fitness®: Finally, since students get a bit crazy during the 100th day of school festivities, I like to give them a chance to get rid of some of that energy. This 100th Day Fluency & Fitness slideshow has students work on naming and recognizing numbers 1-100 while doing exercises every so often. The numbers are out of order, making it a bit harder. It can be a fun brain break without having to lose any instructional time. Here’s a preview of it in action. You can use the worksheet to have students write the numbers they see, or just have them stand up and say the numbers. I have a 120th Day of School Fluency & Fitness® as well. There are over 70 more Fluency & Fitness® sets for PreK-5th grade so you can review letters, sight words, phonics, math facts, place value, etc.